Over on Boardgame Geek there ain’t no hotness like the new hotness. The first instance of this I noticed was in 2005 with Caylus, a complicated worker-placement game that was associated with all manner of wonders and visions. In 2007, miraculous healings were attributed to Agricola, which was an elaborate worker-placement game. Last year the birth of a two-headed pure white calf heralded the arrival of Dominant Species, an intricate worker-placement game. It was on every Best Of list last year except mine, because I hadn’t played it. Yesterday I addressed that shortcoming. Having now experienced (and, for the record, won) the current zeitspiel, what did I think of it? It was…okay. It’s not strictly a worker-placement game; there’s a large portion of area control in it as well. Both of these things are elements I like. For me, though, the main problem was how Baroque it was. 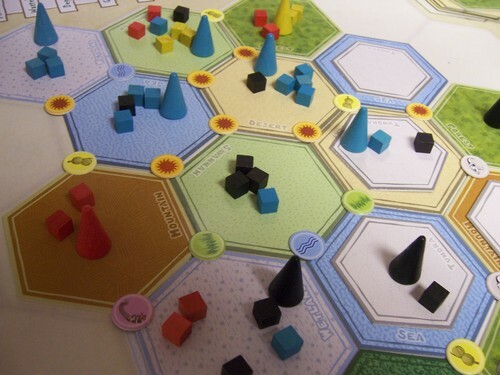 Since it’s a GMT game, home of a lot of complex wargames, and designed by Chad Jensen, who is a designer of complex wargames, there’s an emphasis on simulation that was not going to be avoided. Hence, the game has layers upon layers, wheels within wheels, and an interlocking puzzle-box nature to it which, ultimately, kind of overwhelms the player. This is not a game to play with people who have difficulty making decisions. There’s a lot to like about Dominant Species, though. For one thing, it’s brutal. Nature is red in tooth and claw and having a wargame designer simulate it for you means this isn’t a fluffy “oh heck you took my spot I guess I’ll just get cloth instead!” Eurogame. I imagine that people who aren’t me feel pretty pleased with themselves if they’ve navigated their way to winning this beast (I credit a slap-fight between the two most experienced players as the only reason I won.) The spare design of the game, while turning off a lot of folks who are upset it didn’t include more shades of brown, tan, mahogany, and umber, helps what could be a very cluttered and noisy board give the information it needs to give at a glance (to some extent). And, as I say, underneath all the layers is a fairly easy to learn game. The fact that I’m underwhelmed by Dominant Species comes as no surprise. Not only am I a miserable old coot who hates everything, I similarly didn’t much care for Caylus or Agricola (though I like Dominant Species more than either of those). In my old age, I’m just not that crazy about long, drawn-out games, since the icy hand of death could clutch me at any moment. And while I appreciate a strong, well-developed theme in a game, there’s a point where I want to play a game, not fly a space shuttle. If it makes anyone feel any better, I’m rating Dominant Species a six. That’s not a terrible rating. After all, the other New Hotness of 2010 was Hansa Teutonica and I frickin’ hated that thing. This entry was posted in Boardgames and tagged boardgames, review. Bookmark the permalink. I haven’t played it yet, and now I’m not sure I will. It just looks so… boring. I liked Agricola well enough, but I actively dislike Caylus, so I’m not sure if it’s worth my time. I hate to pass judgement on a game without playing it at least once, but this game has just about fallen of my radar altogether. I’m not crazy about long, drawn-out games either, especially when you have to read a hundred-page manual before you can even begin. 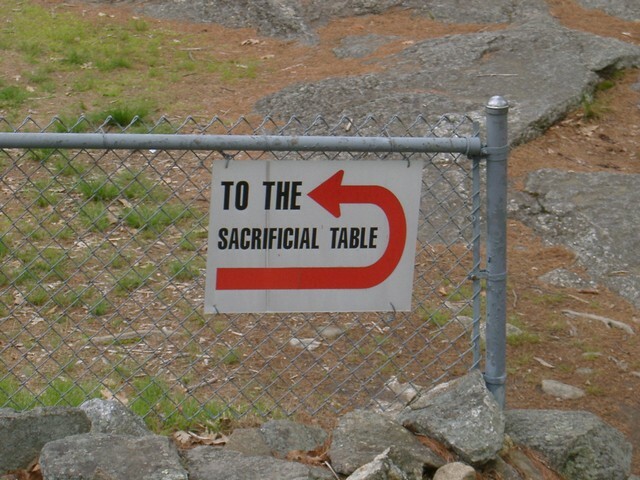 Firstly, I would not agree that the game is overly convoluted. It simply requires a certain number of plays for some strategies and mechanisms to become apparent. Also, If you have a reasonably disciplined crowd who can cut the non-game related chatter to a minimum, this game can be played in less than two hours, including set-up time. I personally find that, once mastered sufficiently to be comfortable with it, the game reveals its true elegance and strategic depth and what appeared as random in the past becomes a beautiful machine with wonderfully interlocking cogs. Overly simple games with but a few winning strategies are something I quickly grow weary of, because after the third game they require only a token mental presence. Dominant Species, therefore, rewards persistence and is not for seekers of instant gratification. So even if the theme might appear iffy to some, the gameplay more than makes up for it. 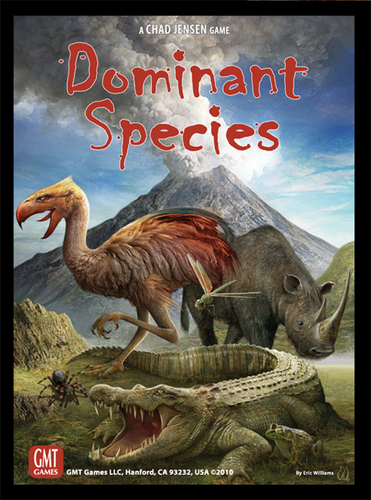 Dominant Species has a very short and concise rulebook, which must be one of the best written ones I’ve ever seen. A single read is likely to give you all you need to start playing. All actions are illustrated with well-chosen examples.